Janitors contracted to clean Home Depot stores in Minneapolis and St. Paul, Minn., announced Jan. 9 they are striking the day President-elect Trump takes office. The Jan. 20 strike confronts Trump’s racist, anti-worker agenda, of which Home Depot’s founders are vocal supporters. The workers, majority Latinx immigrants, are also protesting poverty wages and lack of workplace dignity at service jobs in the area. 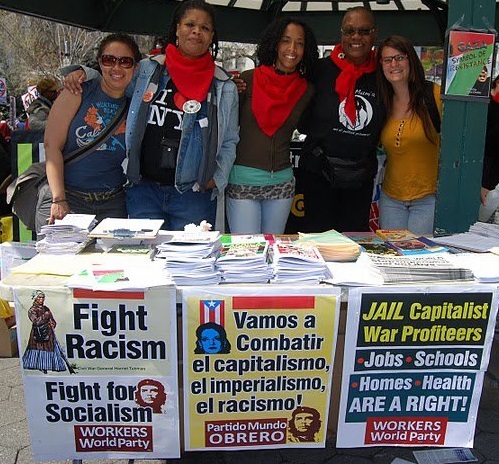 “Home Depot uses the Trump model for its janitorial services” by hiring immigrant workers and conducting wage theft, noted Centro de Trabajadores Unido en la Lucha (Center for Workers Organized in Struggle). 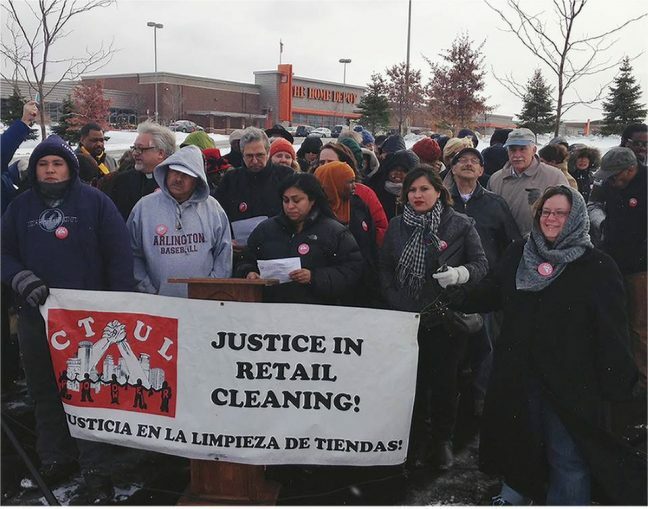 Since 2009, CTUL has organized seven retail janitor strikes and helped the successful campaign to raise the minimum wage in Minneapolis to $15. (ctul.net) For more about the strike, see tinyurl.com/jc7lf76. When negotiations ended Jan. 16, Local 100 had an agreement. Samuelsen posted on the website: “The package provides wage increases which are significantly above inflation and it includes many important negotiated economic sweeteners that will put a substantial amount of money into transit workers’ pockets. This is a concession-free contract. We have protected our health benefits and we have secured important improvements in dental. … Terms will be presented to the full Local 100 Executive Board tomorrow morning” and then to the membership for ratification. 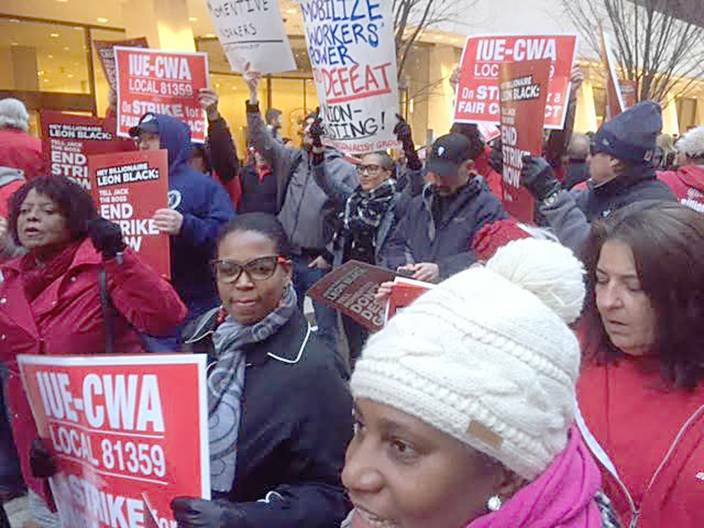 The 700 members of IUE-CWA 81359 (Electronic Workers and Communication Workers) decided to take their strike against Momentive Performance Materials to New York City on Jan. 13. Ever since Nov. 2, the workers have walked picket lines in Waterford, N.Y., to stop massive health care cuts for themselves and complete cuts to health and life insurance for retirees. Ever since Momentive was spun off from General Electric in 2006 to big private equity firms, wages have been slashed up to 50 percent and pensions frozen. 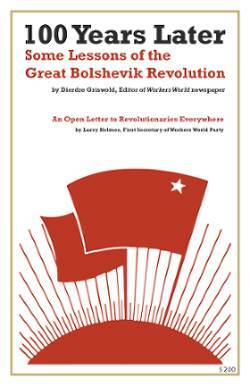 “Enough is enough” is the workers’ rallying cry. Inspired by last year’s successful Verizon strike, the workers are targeting Apollo Global Management, located on New York City’s West 57th Street. Leon Black, the CEO of Apollo Global Management, which owns 40 percent of Momentive, is worth $5.4 billion. 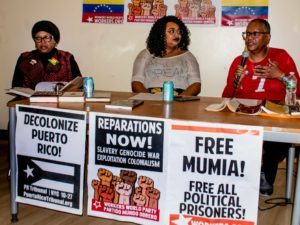 The workers are demanding that Black, who has gotten rich destroying good jobs at companies like Momentive, tell Momentive CEO Jack Boss to go back to the table and negotiate a fair contract. To support the workers, sign the petition to Boss at tinyurl.com/zxqu8fm. Fire Fighters Association Local 36, representing emergency services workers in the Washington, D.C., area, responded Jan. 10 to D.C. Metro’s “outlandish accusation that our members bear responsibility for Metro’s chronic and systemic problems in regards to rail safety.” (iaff36.org) As capitalist austerity continues to wreak havoc on transportation infrastructures across the country, organized labor should expect such “blame games” and scapegoating. Stay tuned. Farm Fresh Foods, LLC, a poultry plant in Guntersville, Ala., was fined more than $29,000 by the U.S. Occupational Safety and Health Administration on Dec. 2 for unsafe work conditions. OSHA learned of these conditions from the Southern Poverty Law Center. When OSHA investigated, it found that water contaminated with chemicals and chicken waste pooled at workers’ feet due to inadequate drainage. Workers risked slip-and-fall injuries when supervisors made them race to move 80-pound crates of raw chicken. Last June, after workers told the bosses about their safety concerns and high rate of injuries, 16 employees were suspended and four of them were later illegally fired. To learn more about widespread abuses in Alabama’s poultry industry, read the SPLC report based on interviews with more than 300 workers who are African American and Latinx.